– The Traction Avant is designed by André Lefèbvre (spiritual father) and Flaminio Bertoni (final design) and was the first mass produced front drive and fully welded unibody construction car in the world. – The original plan was to built the TA with an automatic gearbox. The first generation automatic gearboxes had "big troubles" and was nicknamed "Friteuse" (‘Fryer’), because it boiled constantly the oil in it. – The engineers cobbled together (emergency measure and redesigned within three weeks!) a manual three-speed gearbox (column/dash shift), hardly fitted in the original housing of the automatic transmission. It remained the TA’s weak spot. – It also has independently suspended front wheels and suspension by torsion bars, hydraulic brakes (Lockheed system) and from 1936 rack and pinion steering. – The engines were equipped with overhead valves, very progressive for its time, with wet, replaceable cylinder bushes. – Although the ingenious structure dating from 1934, it remained in production until 1957. And not because there was no successor (DS 1955), but simply because there were still too many "supporters" of this vehicle. – It could be delivered as "7CV’, 11BL "Légère" (as Sedan, Cabrio and Faux-Cabrio), 11BN "Normale" ((as Sedan, Cabrio en Faux-Cabrio), 11BC "Commerciale" (with large tailgate), 11BF "Familiale" (with six side windows and folding chairs ("strapontins"), "Limousine" (without folding chairs), 15/6F, 15/6C (6 cylinder luxury versions) with a trunk or a spare wheel at the back. – The 7-series is produced until 1939. – Coupes and Convertibles were only built before WWII. – During the 23 years of production, the war years included, only a few notable changes to the Traction Avant were applied. The most conspicuous is the modification of July 1952, when the spare wheel disappeared under the trunk instead of the familiar ‘wheel’ back. – On that occasion the windscreen wipers moved to the bottom of the windshield and bumpers became the straihgt rather than the graceful "mustaches" ​​of yesteryear. – Technically only small modifications were made, but never drastic, for instance compression ratio of the engine by improving petrol. – To the urgent call of many customers to a more robust gearbox with four clutches, to a less susceptible driveshafts and a more robust and less complicated front suspension was never given a call by Citroën. They were interested in improving the TA. Only in developing their models of the future: the 2CV (1948) and the DS (1955). – The Traction Avants were produced in Paris (France), in Cologne (Germany), Copenhagen (Denmark), in Vorst (Belgium) and in Slough (United Kingdom, right-hand drive). – Some prototypes with 22CV (100 bhp) V8 engines were exhibited at the Paris Motor Show in October 1934. Citroën had a dozen of these special cars produced. 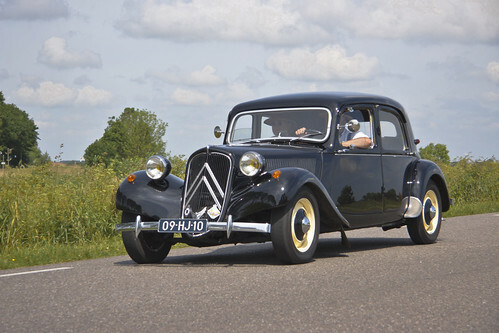 – The 22, however, never went into production and when Citroën was taken over by Michelin in 1935 (bankrupt), the prototypes had been converted to normal models 11. – The story / rumor goes that some copies of the 22 still been delivered to customers. Where these cars have been and what happened to it, is one of the great mysteries surrounding the Traction Avant. Previous Previous post: What’s the Difference Between a Corporate Owned Cell Phone Store Vs Authorized Cell Phone Store?